I attended the local CIO Council annual event which is State of the CIO with Gary Beach publisher emeritus of CIO magazine. Nice attendance, over 150 I guess, many staffing people. A few IBMers, didn't see any Microsoft people, but there were at least 3 Microsoft BPs with tables. I opted not to have a table this year for various reasons and they didn't have any space anyway. The discussion after Gary's session was a Q/A with 4 CIO's. What was interesting to note for me was 2 of them are large Lotus Notes/Domino shops, one a client of mine. The third was from a large software company based here and the 4th represented some of the local sports teams. When a discussion about "The Cloud" came up, my client said that it made no sense whatsoever for them, the cost($) was too great. Plus they have their own infrastructure and like managing everything in house. Similar to my discussions previously about this idea that if you have built your own infrastructure why would you drop it now? The exact opposite came from the software company. In fact they sounded like a company on the verge of death or the verge of being reborn. They have employees bring in their own private laptops to work, no more company supplied ones. The company does provide some monetary amount in return. Can't imagine they have a hardware help desk anymore, so maybe its just about saving some money. They didn't say anyone could work at home, which would be a better solution in my mind. They also started to use their own software for their benefit. This is equally odd since one would expect a company to use the solutions they provide, if for no other reason than to show proof of concept or to help the sales people feel more comfortable in selling the solution. I couldn't help but feel that perhaps they were barely treading water looking for any life preserver. Who knows. Those who read this from Microsoft, I have nothing but awe for your marketing department. You did your job real well, and convinced most sane people that only through pain and suffering can one update a server. In fact you trained your Business partners so well they complain and get it in their head that any upgrade is a multi million dollar affair. Of course if GM had rigged cars so every oil change required new headers, pistons, spark plugs, fuel lines and a radiator, I think more people would get annoyed, don't you? And your jump from 2000 to 2003 and from 2003 to 2008 leaves many companies pondering why do they do this....JUST FOR EMAIL??!!?! Well, as much as I wish that is was true it's a million dollar deal, it just isn't. I really would like to bill my first customer for a million dollar project, so would my business partners, really, so would many others. Instead most Domino admins I know take care of upgrading the server as soon as they can and usually within 15 minutes to 1/2 hour it's done. Backups done previously of course. And when we do an upgrade I can't bill for more than a day of work, in fact my 1st grade daughter can do it, she can read at least, unlike evidently many Microsoft Business Partners who are so afraid to touch Domino. It doesn't bite and it only makes your life EASIER as an admin. So if it is so simple and as you can read in my previous post so cost effective in so many ways, why do you feel you must stay the course and keep spending your money with Microsoft? Do I like this? Oh No I do not! My apologies to Dr. Seuss fans but weird errors that don't even exist on Google can be rather hard to troubleshoot don't you think? Fear not, we have screen shot it, although you may need to expand them to better see it. R8.0.X client was updated to 8.5 Standard, but because of older equipment made an ini change to run in Basic mode. The errors only appeared today, not of course last week when I updated them. 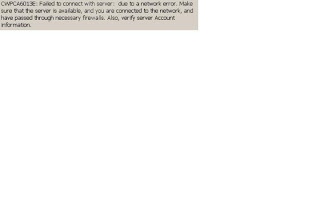 The error shown above is what was happening when the client first opened Notes. I was able to "break in" so to speak and get her connected again to the server and replicate her mail. How odd I thought, an Eclipse error in a Basic client. Hmm. On top of which it looked like a Standard client. Searching Google for CWPCA errors and such showed zero as did IBM support and some fellow colleagues. Stump 1, stump them all....BLOG it. UseBasicNotes=1 ours, while close, was incorrect. Now there is an SPR out on this error and although I am one of few who received it, nothing as yet has been published about it nor that it is being fixed in future releases. No wonder as we created the problem, a hybrid Basic/Standard client. But a technote would be nice, so until then, I guess this is your Technote. Let me start by saying if you are committed in a relationship, either stick with it or drop it. 2009 will go down as the year, in the US at least, where everything changed, from the President to your bank and your bank account or job or home or life in general. Evidently the companies of the world are choosing to drop long time relationships in favor of what some see as short term crutches and it is upsetting quite a few companies, the ones still in existence. 100,000 GSK employees are going to the Cloud. 100,000 in various price points too. How many of these lucky people will also get to work from home? After all if you are going to do this, why not go all out? Commercial Realtors you are about to get FUBAR(look it up). So for about $1.3 Million dollars a month or $15.6 million a year they will get online version of everything Microsoft can offer. Now surely someone said we are already paying Microsoft about $1000 per employee for Windows, Office, plus Lotus costs for email and well sure this looks good. But hold on, what are all these employees going to use for accessing the web? Linux machines? That would make perfect sense, but no, the SAME machines they have now will still be in use. Saving money? not yet. Also all those small offices are going to need more bandwidth or if GSK goes whole hog to let everyone work from home hopefully they are picking up the tab for the internet bill. if so, let's imagine 40% of the company works form home. 40,000 x $50(average per month)= $2 million a month or $24 million a year. This doesn't include the real bandwidth which may be added at corporate. So at $40 million a year this is saving them money? Right. they expect to shave off 30% of their costs over time. How? Once you start with a host the costs only escalate. Have you ever seen them go down? I didn't think so. So let's say GSK is smart enough to lock in some pricing growth limits, like $1 for higher users or a quarter for the lower ones that's still quite a chunk of change in year 2 and going further. Wait, don't forget there are admins for all this. I don't see any of them losing jobs soon. Microsoft is going to manage their user base? I don't think so. So that cost doesn't go away. IT Support also is not going away although maybe they cut a deal for that as well. And classically, what happens when you lose the connection at the wrong moment? What is the BC plan? Business Continuity can be costly to or is Microsoft making GSK pay for a complete redundant data center on both sides of the ocean? Maybe GSK's costs are much more than this, and I know this is not even all the possible items on laundry list of costs(security, disk space, integration to their back office solutions), and a deal like this is probably being underwritten by Microsoft in one form or another. A smarter way to look at their environment could have saved them even more money. But they needed that money for the day the try to get off the Microsoft hosting. Sorry, laptop ran out of batteries and caused some problems. Here is the post. It's just painful, especially when you didn't plan properly(we know it wasn't YOUR fault). For admins even more painful is the magnitude of problems they will face. Especially if you have missed a step or in my case a file or maybe 2. Clients don 't think about the fact you now have to manage multiple servers compared to one previously(or multiply by at least 2 for moving off Notes to Exchange if ALL you want/use is Exchange, otherwise multiply by at least 4 to get the full package). In my case I have multiple backups and drives now after getting my HP laptop returned with a new screen hinge, and a new drive(thanks tigerdirect for the 320GB for $60, maybe even get one for my ideapad) but these are killing me as none will "fix" vista. Not that XP is better, but I am better prepared now for the next backup. Bought an external 2.5" case and that works really well. But I digress. So you have to get your whole network updated to 2008. But you knew that going in...didn't you? No? Your Microsoft rep forgot to tell you that one? And your Business Partner suddenly hit you up for extra consulting fees too? All this to change email platforms, now you have to upgrade your whole infrastructure of Microsoft pieces or nothing will talk to properly? You don't say. Likewise I am reinstalling drivers and software and it is taking MUCH longer than expected. If I had only made the effort before hand to test my backup I would have noticed the thing missed some open files. Or had the external case. I know some of you are thinking loser, and you are right. But there is no fun like reinstalling anything Microsoft. So much so I am tempted to try the MAC osX idea and dual boot my machine. 3) Listen to your friends on Twitter every time or Sametime. 5) It was done on the cheap and may just end up as a cutover and not a migration(how MANY migrations from Lotus end up this way because companies "suddenly" realize what they got into and can't change their budget(for 2-3x more) later in the cycle? 7) I like my new Ideapad so much I just can't go back to the old laptop. Just kidding, I do love it, but working on it the last week or so has reminded me why it is for TRAVELING. And the Ideapad is inheriting the 120GB from the HP soon and that is really needed on it. So learn from my woes, spend the $10 and get an external drive case to do a perfect backup of your drive next time. If only I could cluster my laptops, but that's a whole other post. As some know I had sent my laptop back to HP for them to fix the screen hinge damage. An estimated 10-12 business days or in normal language 2-3 weeks was expected. Imagine my surprise when the email came 48 hours later that it would be on its way back. Very excited to hear this news I brought it to the office this morning and unboxed it to find a note that says the ominous words "Drive reimaged". Uh oh! Yep, HP wiped the drive. Now to be fair, I believe they gave me a new drive as well as a monitor because the problems may have been heat from the processor or drive or both which burnt or melted the hinge. Well that is my story and I am preferring it over the fact that for no reason at all they restored my drive to day one. My laptop I notice now is slower than before but only because I compare it to my Ideapad, which I love, aside from its wi-fi finickiness. Now the problem is in restoring my data to the laptop will take hours, about 7+. And I won't know if anything works properly or not until it reboots. Thanks HP, but next time when I ask if I should include the drive, just say no and also don't promise my data will be fine if you know it won't be. So moving on to Seagate. My love, we've been through many drives together, some good some bad but when you have a monopoly you will be the one everyone comes to. So it's a good thing they stand by their warranty and sent me a new drive so easily. Online site to handle it all, includes directions for packaging and within a week got a new one, in fact it just came. Can't wait to use it, it will be part of a new server I am building, a Red Hat version for our portable server line as a few people have asked about it. No data was on the previous drive and if it was, well no big deal it was on our mule. So off I go to format a new drive and play with Red Hat.